BEACON FALLS — Even though the Woodland boys swim team didn’t pick up any event victories Tuesday in an 89-81 loss to Seymour, Hawks coach Tom Currier is proud of the way his scrappy team is competing in dual meets. Woodland holds a 3-2 dual-meet record as it approaches the midway point of the regular season this weekend. The Hawks’ loss to Seymour on Tuesday was their first defeat in Naugatuck Valley League competition. They’d previously earned wins over Oxford, Crosby-WCA and Kennedy. 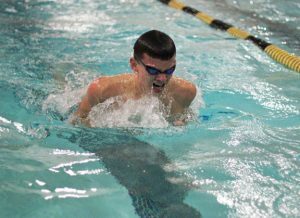 Currier is also pleased with the efforts of junior Greg Aldrich (breaststroke, individual medley) and senior Chase Chura, among others. He’s been happy to see the group of a half-dozen freshmen acclimate well to the high school waters, too. 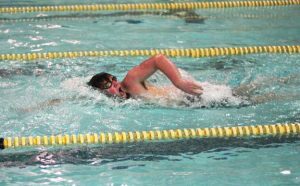 Currier’s hope for the second half of the season isn’t anything dramatic — he just wants to get in the pool a little bit more often. Woodland will visit perennial NVL contender Sacred Heart on Friday before hosting Wilby on Tuesday.